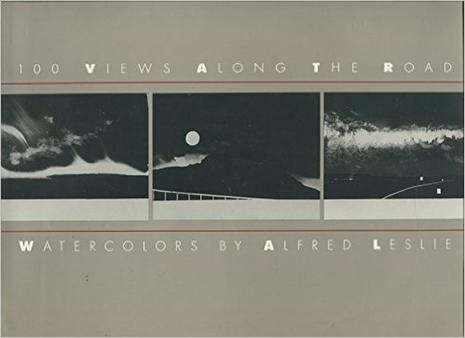 100 Views Along the Road is a series of elegant black-and-white watercolors of American scenes that Alfred Leslie made between 1981 and 1983. They were all painted in Leslie's studio from drawings he had made, mostly in his car. The title of Leslie's series suggests another great cycle of narrative images, Hiroshige's One Hundred Famous Views of Edo. Like Hiroshige, Leslie has selected views that, if not famous, are certainly familiar and has proceeded to subvert this familiarity through a series of bold formal devices. Where Hiroshige's Edo scenes depicted a very specific locale, Leslie's Views conjure instead a more generic American experience: the endless ribbon of American highway and our common culture as a nation of drivers. Painted as they are in watercolor, Leslie's views play on the nineteenth century tradition of the travelogue. The luminosity of the watercolor combined with Leslie's attention to detail, geometrically ordered composition, and engagement with the transitional effects of light also allude to the paintings of such nineteenth century Americans as Fitz Hugh Lane or Martin J. Heade. But Leslie's pictorial narrative owes as much to his own thorough exploration of abstraction as it does to any of these historic traditions. His unorthodox use of only gradations of black for 'color' as well as his sophisticated understanding of narrative as 'just another formal element' in painting is decidedly contemporary. Though we might well mistake his black-and-white watercolors for photographs, we also know that Leslie 'paints light as paint'.